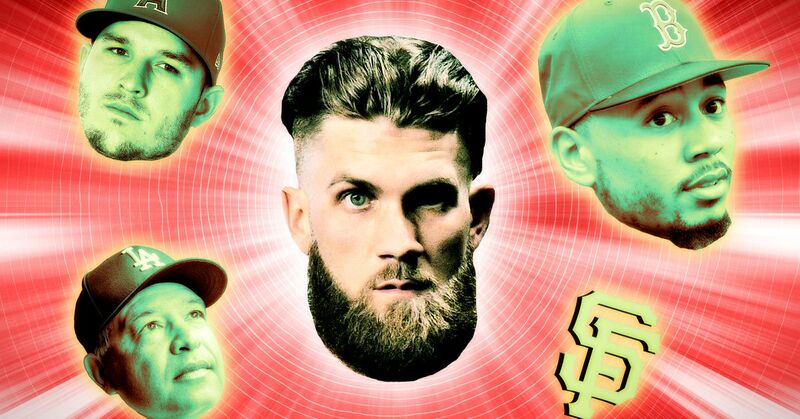 Bryce Harper is a Phillie, probably for life, after agreeing Thursday to a record 13-year, $330 million contract with no opt-outs and a no-trade clause. Despite the initial shock inspired by that length and total value, the structure confers benefits to both parties: Harper receives the largest contract by total value in U.S. sports history, while the Phillies can spread the payment over more years to reduce the per-year cost. At any rate, the history of players as productive as Harper at such a young age supports the idea. But Thursday’s agreement doesn’t just change the Phillies’ outlook or the possible ball cap on Harper’s Hall of Fame plaque two decades down the line. The ripples extend throughout the sport, from San Francisco, where the band Smash Mouth laments the lost potential star, to the Yankees’ spring training clubhouse in Florida, where the word “thirteen” reportedly echoed after the news broke, and everywhere in between. The Giants project as one of baseball’s worst teams this season, after winning just 64 games in 2017 and 73 in 2018, despite making win-now moves—trading for Andrew McCutchen and Evan Longoria, among others—last offseason. FanGraphs forecasts a 75-87 record for San Francisco this year, Baseball Prospectus 73-89—and both marks are the worst in the NL outside Miami. Harper alone wouldn’t have fixed the Giants’ 2019 problems, which range from an aging core to a spotty staff to an outfield that would need two Harper-level players to look good. But he would have made them better this year, and he would have made them better in 2020, and he would have made them better in 2021 and beyond. Like Manny Machado with the Padres, he’s young enough that he would’ve still been in or near his prime when the Giants’ slow rebuild through the minor leagues was ready to return the major league club to the success it experienced in the first half of this decade. The Giants’ desperation didn’t match the Phillies’, after Philadelphia made several win-now transactions and needed a climactic capper, but he certainly would have helped. Harper isn’t the best right fielder in baseball, because Boston’s Betts plays the same position. The 2018 AL MVP is the same age as Harper but isn’t slated to reach free agency until after the 2020 season, so he’ll be two years older when searching for his big contract. Last season, even after a relatively down year in 2017, Betts won his arbitration case to earn $10.5 million (Boston had offered just $7.5 million), and earlier this winter, he and the Red Sox reached a $20 million deal for this season to avoid having to go to arbitration for a second consecutive year. That total represented a record for players at that stage of the contract process. So Betts is no stranger to record amounts of compensation, and, even with the age difference, it would be difficult to imagine Betts signing for less money than Harper in two years. He shouldn’t, anyway, given the skill gap between the two players in Betts’s favor. Or, much like Machado’s free-agent deal this winter provided a template for the new Nolan Arenado contract with Colorado, Harper’s contract could serve as a baseline number if Boston wants to extend its star before he reaches free agency. Then the potential age difference wouldn’t be a factor and the two sides could negotiate starting with an apples-to-apples comparison. Either way, plenty of dollars will soon come Betts’s way. Except Betts shouldn’t even collect the largest payday for a right-handed outfielder in his own free-agent class. That’s because Trout, the best player in baseball history through age 26, is also scheduled to reach the open market that winter, after the six-year extension he signed in 2014 expires. Through that agreement, Trout has earned $78 million in four years and is due to earn another $66.5 million over the next two; in that time, he’s been worth more than $70 million per season based on dollars-per-WAR calculations. Trout’s current contract went for nine figures and still represents a massive underpay. Like Betts, Trout will be a few years older than Harper is now come the winter of 2020, which could scare off teams that fear adding a player for his decline. But again, Trout has been the best player in baseball history thus far in his career, and he continues to improve in meaningful ways every year. This winter, Harper and Machado signed for a combined $630 million—and Trout has been as valuable as those two stars combined over their careers. It’s impossible to overstate how large a contract Trout should command in two winters, if owners and front offices operate in good faith. If anything, the problem for Trout might be that he is so much better than every other player who’s negotiated a contract of this magnitude that the precedent isn’t right for him to garner his true worth. When every other “biggest contract ever” hovers in the $300 million range, it could be a tough ask for the $400-plus million he would receive on merit alone. He’s from South Jersey and is an avowed Philly sports fan. What if, after years of Harper-vs.-Trout debates—which have since been answered firmly in the latter’s favor—the two outfielders end up as teammates in Philadelphia in two years? Harper’s contract is large, but if owner John Middleton truly has “stupid” money to spend, why not? Along with the Phillies and Giants, the Dodgers were pursuing Harper in the late stages. They seemingly didn’t want to invest in a long-term deal, however, reportedly preferring shorter unions with higher per-year payments to fit with a broader organizational philosophy: No current Dodger contract extends longer than five years except Kenta Maeda’s (eight years), which carries a minimal base payment and is instead laden with incentives and performance bonuses. Harper ended up selecting a contract on the opposite end of that spectrum, meaning the Dodgers can fit all their salaries under the luxury tax threshold in 2019. Yay for L.A.’s owners, and yay for the investors those owners have tried to recruit with the promise that they wouldn’t have the gall to step a toe above that line. Never mind that L.A. is the second-richest club in baseball or that the Dodgers have shaved nearly $100 million off their payroll just since 2015; never mind that they traded productive players like Yasiel Puig and Alex Wood this winter and let others leave in free agency just to lower their tax configuration and engage in “baseball money-laundering.” And never mind that L.A. hasn’t won a World Series in 31 years—a sad streak a player of Harper’s caliber might help snap. The Dodgers’ suits will save money in 2019, which is what truly matters. The Phillies haven’t hit homers at a rate befitting the majors’ second-friendliest ballpark for home runs in nearly a decade, when sluggers like Ryan Howard and Chase Utley were taking aim at the distant concourses. But this winter, Philadelphia’s lineup added Harper, McCutchen (20 homers every year since 2011), and J.T. Realmuto (21 homers last season, third among catchers). Unless something goes seriously wrong, balls will start flying in Philly once again. The Phillies added Harper, McCutchen, Realmuto, Jean Segura, and David Robertson. The Nationals lost Harper but added Patrick Corbin, Brian Dozier, two new catchers (Yan Gomes and Kurt Suzuki), and depth. The Mets added Robinson Canó, Edwin Díaz, Jed Lowrie, Wilson Ramos, and more depth. The Braves were relatively less active but still added former MVP Josh Donaldson and enter 2019 as the reigning division champs. Every month this winter, the NL East race has grown more contentious, and the more than 100 games among these four teams this season should be electric. They also play in the NL East, and, even before accounting for the impact of their division-mates or schedule, they project as the worst team in baseball. This season could be tough. Harper was a Yankees fan in his youth. He wears no. 34 because the two digits sum to Mickey Mantle’s number (3 + 4 = 7). He could have played in pinstripes through his 30s if the team that made them famous had evinced even the slightest interest in adding his left-handed power to its friendly home park. But the presence of Giancarlo Stanton, the player whose previous 13-year contract Harper’s exceeds in total value, apparently precluded that possibility. The Yankees traded for Stanton and his contract last winter, and with both him and Aaron Judge in the fold, they reportedly didn’t make any effort to pursue Harper this winter. Instead, they signed center fielder Aaron Hicks to a seven-year, $70 million extension last week. Hicks is a capable and underrated player whose extension makes sense in a vacuum, but it’s a strange thing nonetheless for the Yankees to extend Hicks and sign Troy Tulowitzki and DJ LeMahieu to smaller deals instead of making a real effort for Harper or Machado. If ever the Steinbrenner children wanted to show that they aren’t running their father’s Yankees, Thursday sealed the deal. The Cubs could have been another attractive Harper suitor. They employ Kris Bryant, an MVP in his own right and one of Harper’s best friends. They have an obvious spot for him in the outfield. And yet, according to owner Tom Ricketts, they didn’t have the money to try. Chicago’s roster isn’t as bad as their now-infamous fifth-place BP projection suggests, but as the Brewers and Cardinals and Reds spent the winter making meaningful improvements, it will be easy to know where to direct the blame if the Cubs start slow in a competitive division in 2019. After many months of frustration, Harper and Machado finally found the money they deserved, but those deals by themselves do not signal that the market’s infection has lifted. Craig Kimbrel is still unsigned as March approaches. So is Dallas Keuchel. Useful veterans like Gio González, Adam Jones, and Martín Maldonado may have to accept minor league deals just to audition for a team next month, as other established players have been forced to accept already. Even Harper’s and Machado’s contracts are lighter than strict dollar-per-WAR valuations suggest they could be worth over the next decade-plus. The frustration from players will—and should—endure as teams continue to operate in this fashion. Yeah, San Francisco fans aren’t handling this one well.